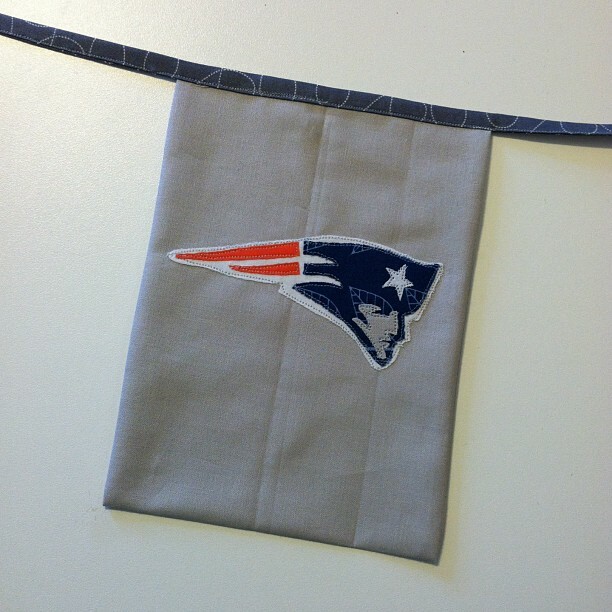 Over the weekend I took some time to make a flag for the "To Boston with Love" effort put on by the Vancouver MQG. I kept seeing all of these awesome "B" blocks pop up in the Flickr group, representing Boston and the Red Sox, so I knew I needed to make sure my beloved Patriots were represented. The logo is raw edge appliquéd down to the gray background. While it's hard to tell in this picture, I took a little liberty with the colors of the logo to go more with the color scheme the VMQG provided. The red is actually a bit more coral and the blue is a bit lighter than the picture implies. For those looking to make a flag for this wonderful effort you can read more about here. I can officially call this quilt - Pinwheel Delight - finished! It was my goal to finish this one as part of A Lovely Year of Finishes, and I'm happy to report that my goal was met. This isn't my usual color pallet - especially the mustard yellow. I am in love with this color pallet and might just need to make another one of these for myself. 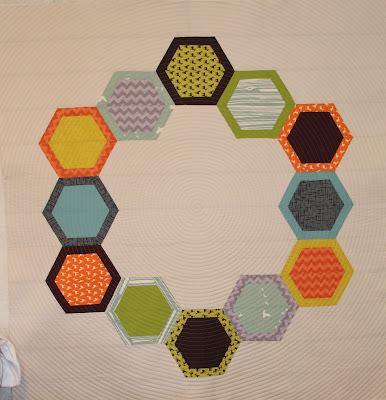 Or make another quilt in these same colors. This quilt will be shipped off to my partner in the Modern She Made Swap this weekend. I'll be sad to see it go, but know it will be going to a good home. I've been a part of this swap since round one and have been impressed with the items created by the folks participating. There's always a catch - some element we need to incorporate into our items. This round we needed to include a star somewhere in our item. 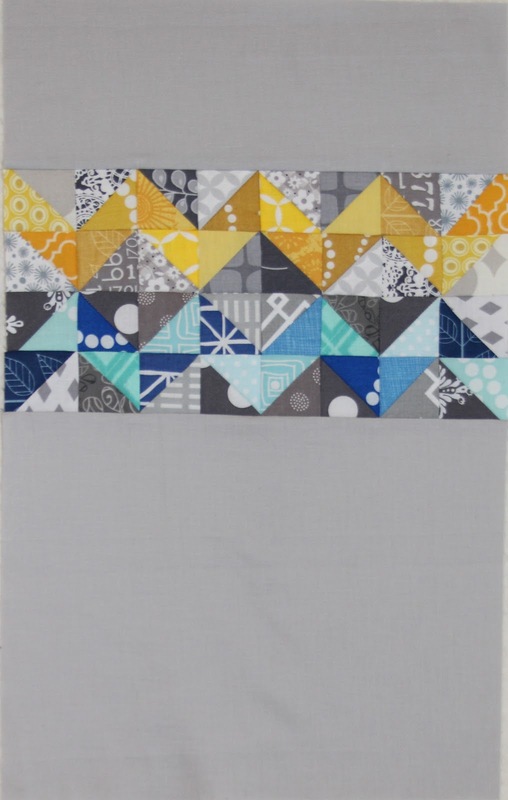 I designed this block a while ago, so when the theme of stars was announced, I knew I wanted to make this quilt. I really love all of the secondary designs that are formed when you put multiple blocks together. Overall, I'm really happy with how this turned out. 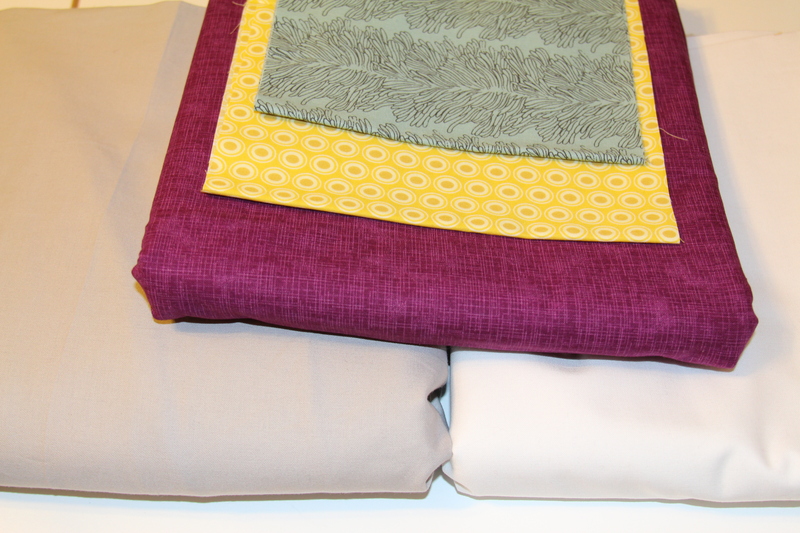 All of the fabrics were from my stash but include: Kona Cotton, Quilters Linen, Oval Elements and Curious Nature. I kept the quilting quite simple given the complexity of the front. Because so many pieces meet in one place at times, sewing over those areas would likely have resulted in a broken needle. You can really see the quilting on the back. Many of you may have already seen the amazing outpouring of support from our friends in the Vancouver MQG: To Boston With Love. If you haven't read about this effort organized by the VMQG, please read more about it here. Throughout this whole ordeal, we've seen images of love, courage and support. It's these images that we need to hold onto and remember years from now. It's the playing of Sweet Caroline at other MLB ballparks, even Yankee Stadium that need to be remembered. It's the pictures of those helping the injured without any thought of their own safety that should be remembered. It's the marathon runners finishing the race and continuing to run to donate blood that restore faith in humanity. It's the tributes pouring in from around the world, like at the London marathon, that show how truly amazing our society really is. And, it's efforts like those of the VMQG and other quilters that warm our hearts. As a fellow member of the Boston MQG, I first and foremost want to say thank you to everyone who has shown their support and is taking the time to make flags. We met as a group over the weekend and talked about how amazing this gesture is and what it means to us. We're looking to do something ourselves as a guild, so stay tuned for more details. Every one of us in the guild was affected one way or another. Many were on lockdown as the suspects were on the run. We knew people who were running or watching the marathon. So many of us went to school in the Boston area and frequented the areas where everything went down. For me, I have watched that marathon at least half a dozen times in person. I've walked Boylston St. too many times to count. I went to college just outside the city and frequent it often. I was just there yesterday checking out my sister's new condo that she just purchased - not even 500 ft. from where the suspects lived. She's a teacher at the high school they went to, although she never actually taught them. Everyone I talk to has a similar story. This has hit incredibly close to home, which makes the outpouring love and support that much more meaningful and greatly appreciated. Through all of this, I think we have shown the world how wonderful Boston is as a city. If you haven't visited our amazing city, I encourage you to come visit sometime. As you've seen, we're a very proud city filled with some amazing people. I spent Saturday at the New England Quilt Festival, formerly MQX. I forgot my camera, but I did post a couple of pics to Instagram of some of the quilts. 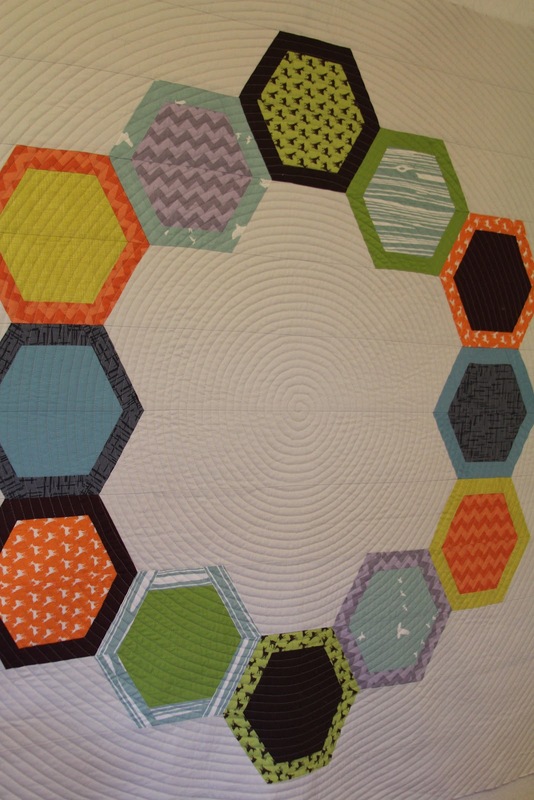 The show features more traditional quilts, but with some phenomenal machine quilting that any quilter can admire. The vendors didn't have a ton of modern fabric, and I only came away with a couple of yards of fabric from Sew Fresh Fabric. I had been thinking about buying a long arm for a little while now, and after test driving a bunch of brands, I narrowed my search down to Gammill and Handi Quilter. I spent quite a bit of time at both booths at the show, test driving the machines again and talking to the folks in the booth about the machines. 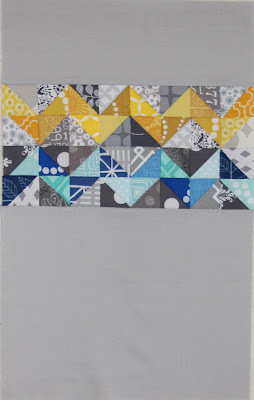 I really liked both of them and probably would have been happy with either, but ended up going with Handi Quilter for several reasons. First, they had a REALLY good deal going on. Second, the rep and repair folks I would be working with were out of a shop I'm familiar with and have a good reputation for machine repair. Third, the Avante had a more flexible table. With Gammill, I could only set up the table to one size and that would be it forever. With HQ, I could set the table up at 4', 6' or 10' and can buy additional 2' sections if I needed it. So, I have to wait for this to ship to the store and for them to set it up, so I likely won't be able to play with it for a few weeks. So expect to see me practicing on a bunch of panels and the like. I have a bunch of old quilt tops that have yet to be quilted that I'm sure I'll practice on as well. I've been pretty quiet on the blogging front lately, but that's because I have a couple of secret projects in the works that I can't reveal just yet. 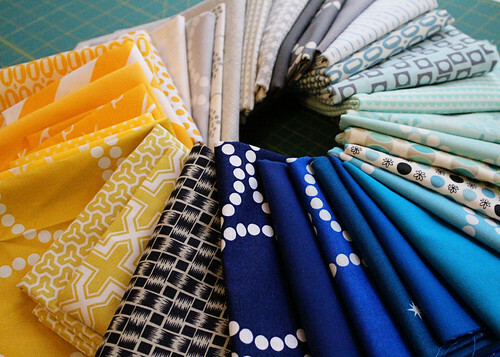 Hopefully I'll have some pretty quilts/projects to share with you soon, but for now, you're stuck looking at some pretty fabrics. This week I finished the final stitch in my Mod Hex 2 quilt. I still need to make and attach the binding, but overall, I'm really pleased with how it turned out. 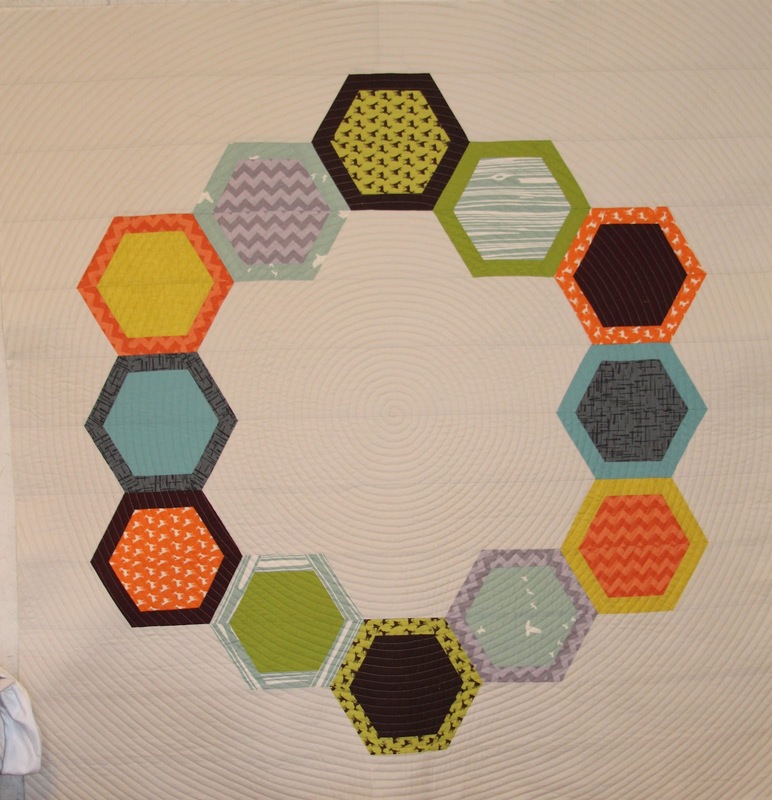 Once again I did a concentric circle quilting design, which I really love. I really want to use something from my stash for the binding, but I'm not sure I have anything that goes with this. These aren't the typical colors I work in - they're much more earthy than I'm used to. Well I failed miserably with my March goal of finishing my HST quilt. I don't think I even touched this one in March, but that was probably because I traveled three times last month for both work and pleasure and was then named a finalist in the Sew-vivor competition, so my sewing plans were thrown for a loop. This month promises to be just as busy with work, so who knows how much time I'll have to get stuff done. That being said, I'm going to set a goal for myself to finish my Modern She Made swap item by the end of the month. I think this is a realistic goal since I need to have my item finished by early May. 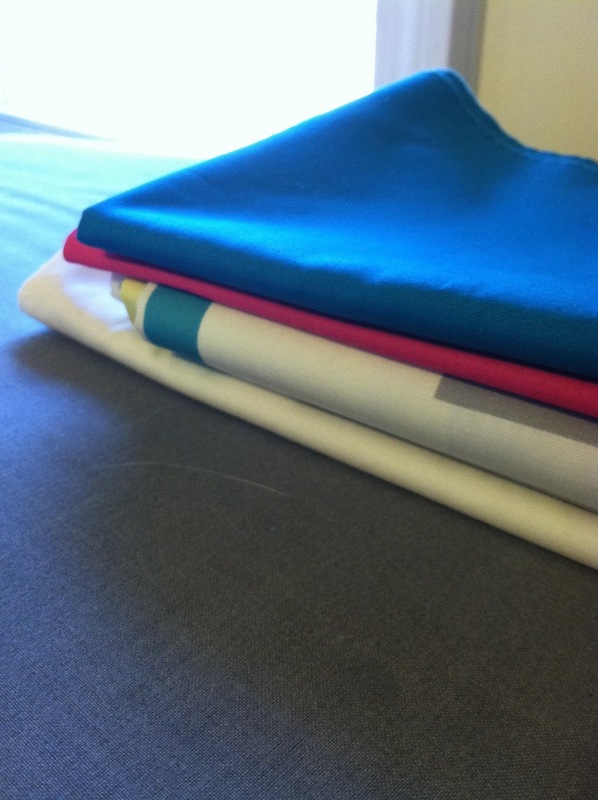 Of course, I haven't even started, but I did pull this lovely stack of fabric. 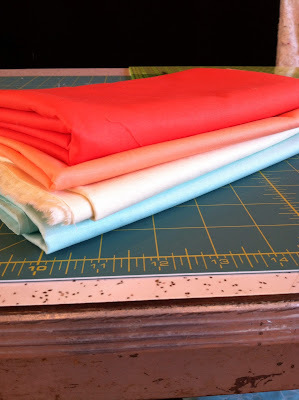 I will be making a mini quilt using these colors. I'm going with the gray as the background instead of the white. I might even make two, one for myself and one for my partner. The only requirement for this swap is that the item must include a star - totally up my alley.